If you don't see something here that you would like done to your vehicle, please let us know. We will do our best to accommodate your needs. 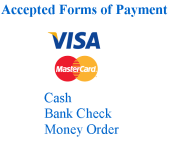 Payment is due upon completion of work and pick-up of vehicle. All workmanship is 100% Guaranteed! Dealer's and Commercial Accounts always welcome. ​*All prices are subject to change depending on vehicle's overall condition. Excessive scratches, heavy stains or dog hair will increase the price. We can estimate cost when vehicle is on site.